The promtion behind Cambridge Folk Festival generated the MyFolkFest hashtag to coordinate online interaction in 2018, thus hitting home the assertion that festivals are very personal experiences. Large acts or smaller ones; Cash or First Aid Kit; Moreland or Smith were all questions to arise across the four days of this year’s renewal. First world dilemmas I know, but immersing yourself into a multi artist gathering, on a moderate scale to a degree, does require a thoughtful approach, even to the extent of the casual roam versus the meticulous planning. For this look back at four sun-drenched days in the packed confines of Cherry Hinton Park, a project titled 50:20 was born. The challenge to write fifty words about twenty sets has been modified slightly as the number witnessed in their entirety on the two main stages came to eighteen. However, and in pursuit of that round number, who can resist a little summary of what stood out in the Den and the Club Tent, alongside the most mesmerising and uplifting way to end a festival. Amythyst Kiah moved the furthest up my appreciation scale with a superb revealing set relished from a close up perspective for the first time. There have been previous promising glimpses, but nothing like letting an artist glide through a powerful performance in a way to truly demonstrate what they are. Birds of Chicago rolled into Cambridge with a full band in tow and a pedigree to shine in the rock ‘n’ soul vocal style. JT and Alli rarely fail to disappoint and their festival invitation proved an inspired choice. A set to whet the appetite for more shows next year. The delayed start to Eliza Carthy and the Wayward Band did nothing to diminish an absorbing display of musicianship from a highly accomplished twelve-strong collaboration. If anything, it inspired Eliza to maximise the excellence in a concise manner and provide a snap shot of folk music in its triumphant form. First Aid Kit won the battle over Rosanne Cash on the back of their vibrant crest waving charge through the genre barriers. Johanna and Klara may well rock out in their headlining guise, but underneath they sparkle with marvellous songs and majestically join the eternal club of blissful sibling harmonies. Grace Petrie has waited a long time to get her fervent message over to a Cambridge audience, though not the toughest sell. The art of the protest singer will never die as long as artists like Grace pick up a guitar and let their heart run riot over the songs. Canadian, Irish Mythen, with the heritage in the first name, headed this year’s list of new discoveries with the most impassioned midday main stage set you could imagine. Marrying wit and critical political discourse in a powerful manner proved inspirational. Wrapping your message in an entertaining way wins the day. John Moreland or Patti Smith, no debate for many, but few regrets over choosing the man from Oklahoma. Heartbeat qualities evoke and naturally emanate from the artful song. This is real deal Americana in its rawest and most relevant form. A writing genius who finds the discerning listener’s sweet spot. 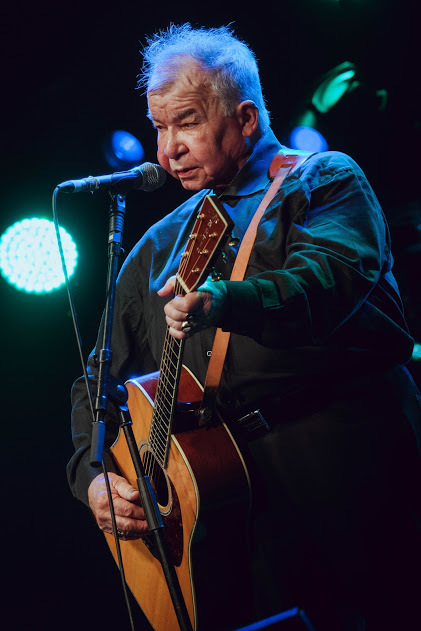 No dilemma seeing John Prine as this songwriting legend bridged his lengthy career with a set packed full of witty, insightful and just damn good tunes for the literate ear. The Sunday headliner came and conquered in the only way he knows. The songs of John Prine enrich the world. The Den and the Club Tent are the life support locations of Cambridge Folk Festival, and its ethos to evolve. Thanks to Katie Spencer (pictured here), Paul McClure, Zoe Wren and Hazey Jane for proving the highlights of my many saunters over to the far-flung venues of the festival site. The star of Marlon Williams will soon shine brightly in the UK as it does across the world. Last year’s late night slot at SummerTyne was a mere aperitif for this full band show on the main stage. A voice for the ages, which travels as far as this Kiwi. The somewhat overused term folk super group is no hype when John McCusker, Roddy Woomble (pictured here) and Kris Drever hook up. Classy, polished and distinguished are the opening shots of the superlatives as they ensured the festival got an accomplished lift off on the increasingly popular Thursday evening presentation. Guest curator, enormously dedicated archivist, supremely talented all-round musician and vocalist, it was easy to anoint Rhiannon Giddens as the star of Cambridge 2018. Whether delivering a stunning main stage set, thriving in surprise pop up locations or orchestrating the most absorbing of finales, her overall involvement was a triumph. The trajectory of Robert Vincent continues to power forever upwards. Band shows now appear the norm and his material sits comfortably in a multitude of settings. There was an apparent toning down on the rock side for this set, demonstrating an artist adept at layering great songs in various ways. Songhoy Blues is the ultimate festival band. Submerging into the rhythmical world of Mali blues is the best way to savour an act now establishing themselves on main stages across the land. Interaction, collusion and movement are optional, but empowering when applied in a setting of shared love and feeling. Led by Georgia Shackleton, the simply identifiably titled The Shackleton Trio opened the main stage on Saturday with a fine display of folk music in its purest form. No thrills or deviations just highly crafted musicianship and beautiful vocals. A graceful launch into the frenzies of a busy festival day. All the way from Austin Texas, Whiskey Shivers had the proud honour of opening Cambridge 2018 and ensured their raucous festival style met with rapturous audience approval. Covering The Cure and the Dixie Chicks showed their diverse influences, but this band was up for injecting plenty of good time vibes. With a booming voice, a steely gaze and a menacing prowl around the stage, William Crighton was one Aussie invite to hit you hard. Adjustment to the wavelength made, and he delivered a pulsating set of multi-layered folk music, evoking the spirit of the land, people and issues Down Under. Yola Carter is a highly talented British vocalist drawing praise from far and wide. An artist capable of mixing it with the best on the vocal scale, and moving into a position where her potential to evolve a career in this new singer-songwriter direction will get its opportunity to shine. A spectacular rousing end to the festival with Rhiannon Giddens leading her invited guests of Amythyst Kiah, Yola Carter, Kaia Kater and Birds of Chicago in a glorious celebration of song that nearly brought a packed Club Tent down. A powerful parting shot of hope and staunch expectation of change. Personal maybe, enjoyable thoroughly, although regretfully the omnipresent power to see every act is yet to surface. 50:20 accomplished with painstaking accuracy and a shot of social media conciseness. Cambridge Folk Festival is a legendary event that can call its own shots. In 2018, it well and truly took on the gender disparity that is a highlighted blight on musical landscapes across the world. One footnote was a wholly white audience belting out a black pride song as the festival clock struck 11 on Sunday evening. A blessed Rhiannon Giddens was pleasantly struck with the irony. Is there an elephant in the room, or is that for another day? Although appreciation for Eilen Jewell traces back to the 2007 album LETTERS TO SINNERS & STRANGERS, opportunities to see her live have conspired to leave this ambition unfulfilled. Finally, circumstances fell into place to make the trip up to the Potteries on the eve of the Cambridge Folk Festival and catch a show at Biddulph Town Hall. Her previous visits to the wider Midlands area have tended to concentrate on the eastern side with last year’s Nottingham date attaining sold out status during the run up. That show was on the back of her 2017 album DOWN HEARTED BLUES, which once again saw Eilen take a break from original music and explore another fascinating aspect of the roots world. The clue to the style is in the title and it was set to feature prominently this evening. The early and middle parts of 2018 has seen Eilen and her long time trio of travelling musical companions cram in as many dates around the globe as possible before once again embarking on a little family downtime prior to the promise of new original material. Ahead of Eilen and the band taking to the stage, a well-populated hall enjoyed a short set from singer-songwriter, Lissy Taylor. Hailing from Stoke-on-Trent, but audibly schooled in Lexington Kentucky, Lissy eased into the opening role with a bunch of original songs taking their influence from a host of personal situations and surroundings. Her sound was drenched in country folk sentiment, and although Lissy herself used the word 'pop' in her self-introduction, the added feel was one of indie, albeit from a slow moody perspective. You could quite envisage the songs getting the atmospheric electric treatment. She had a similar statuesque poise on stage to Erin Rae, and a tempo that similarly hooked you into the groove. A southern twang had infiltrated the vocals, although there was no mistaking her roots between songs. Overall, an effective opening act with heaps of promise at her feet. A name to look out for in the future. Flanked by band members, Jerry Miller (electric guitar), Shawn Supra (electric/upright bass) and Jason Beek (drums/percussion), Eilen Jewell set out to show why she has cut a highly respected career as one of the most innovative and exploratory artisans of American roots music over the last decade. A sleek and classy style breezed through an impulsive set stretching the breadth of her career, with more than a slight bias towards the most recent album. Eilen’s love of the blues may not be in her DNA, but it is certainly in her soul. Starting her set with ‘It’s Your Voodoo Warning’, she frequently dipped into songs covered on the recent record such as the title track, ‘Nothing in Rambling’ and ‘Don’t Leave Poor Me’. Names that have clearly influenced her shared during the evening included Willie Dixon, Bessie Smith and Memphis Minnie. Such is the diverse aspect to Eilen Jewell’s music, the term ‘Americana’ as referenced by a pot pourri of American roots sounds could almost have been invented for her. Country music features strong and it was of no surprise to hear a Loretta Lynn song covered. In fact, ‘You Wanna Give Me a Lift’ was one of the tunes featured on her 2010 tribute album to the legend. ‘Heartache Boulevard’ and the requested ‘Boundary County’ also reflected this chosen style. With the band that Eilen has assembled, good ole fashioned rock ‘n’ roll was always going to play a part. Plenty of upright bass was slapped by Supra alongside multiple scintillating guitar riffs and solos from the outstanding Miller. Beek had his moment in the sun towards the end when advancing from behind the drum kit to lead on the washboard, straight out of Columbus Ohio. Outside her genre specific material, plenty of other old favourites thrilled the audience including the triple opening to the LETTERS album of ‘Rich Man’s World’, ‘Dusty Boxcar Wall’ and ‘High Shelf Booze’. When in full flow, few songs were better than a riveting foot tapping version of ‘Sea of Tears’. Perhaps when we just needed a helping hand down before heading home, Eilen ripped open her heart, and in solo mode accompanied only by harmonica and acoustic guitar she shone an adoring light on her daughter in the track ‘Songbird’. Quintessentially folk in the delivery style and likewise beautifully sung. As indicated previously, this gig was on the eve of a return to the Cambridge Folk Festival. Not relevant regarding the Eilen Jewell tour schedule, but symbolic to the strains of musical variety that are likely to dominate this four-day event. The evening concluded on a note of mission accomplished. Nothing gained from harking back over lost opportunities, but fully blessed that the chance to finally see Eilen Jewell play live had been grasped, and this gig-going adventure become a little richer. If Emmylou coined the phrase ‘Boulder to Birmingham’, then why not evoke the alliteration ‘Boise to Biddulph’. Deepest Idaho and the Potteries interwove this evening.